When it comes to finding the best ear protection for shooting there are a plethora of things you should consider before making your decision. Things like noise reduction should of course be primarily considered along with other things like build quality, battery life if even used at all, fit and comfort and a host of other things I will get into in more detail when I cover my best options. After testing over 20 different sets of earmuffs I have come to the conclusion of the best options which are below. 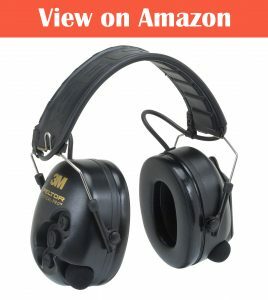 While it might be surprising that 2 of my top 3 options where very budget friendly I wanted to include them because of their great quality and build and amazing value for money but if you are looking for a high end option this is the best ear protection for shooting without a doubt. If blocking out sound is your number one priority, then these are the best option for you. When it comes to blocking out noise they are tremendous, it makes even shooting the loudest gun’s sound like a soft thud when wearing them. Their noise reduction rating(NRR) is 26 which is one of the best. Their comfortability is very good thanks to being well padded around the muffs themselves and having a nice quality head band. I could wear them all day (8+ hours) and didn’t feel any strain or soreness around the ears and face – the deep ear cups are a reason for that. When it comes to features this TacticalPro headset is always listening. What I mean by this is it hears the soft and normal sounding noises and emits them through the headset so you still can hear everything around you as normal but when it detects a louder noise like a gunshot it will automatically suppress it. This is one of the features I really loved about this headset, you can easily have a conversation with someone even in a loud environment all while not having to adjust anything – it just works and that’s why is such an intuitive feature. I can easily recommend them and if you are a person who frequents the shooting range then for me these are great investment. Let me first start of by talking about how comfortable these earmuffs are. They are incredibly comfortable – sometimes I even forget I was wearing because of their sheer comfort. I was easily able to wear them for 10 hours + without feeling any irritation or annoyances around my ears or face. Now in terms of performance I could shoot a fully automatic machine gun and they did the perfect job – this was at roughly a third of the way with the volume turned up. When I turn the volume off I am easily able to have a conversation with someone without feeling weird like you do with some of these earmuffs, so that is an advantage if you are shooting with friends and don’t want to have to remove them to have a normal conversation. They are lightweight and low profile – they won’t interfere with any shooting position that I have tried or can even imagine. They have a noise reduction rating of 23 dB which is easily compatible for any kind of shooting no matter the weapon. I only needed to turn the volume to a third of the way through to get the sound protection to what I was looking for. With these earmuffs, you are easily able to able to connect your phone or mp3 player for example to listen to your own music or even make a call if you wanted. These earmuffs also can be folded down so they will use very little space in your backpack. In terms of battery life, they are powered by 2 AAA batteries which are included and have an immense battery life and even when they do run out of power they are easily replaced. 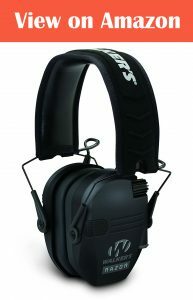 These earmuffs are a great all-rounder – they have everything you want and need from a set of ear protection all at an affordable price point. My top 3 starts with one of the best sellers and I can easily understand why they are so popular they are an excellent product – let me explain why. These earmuffs are powered by 2 AAA batteries that of which will automatically shut off after 4 hours of usage to help maintain battery life which is a nice feature to have. They are constantly detecting the volume of the sound and if its below 82 dB it will turn off the amplification – this is a very useful feature because it will automatically only use it when it’s needed. This allows for just normal protection from the sound when it’s not too loud and allows you for better awareness of your surroundings when the noise isn’t too loud. This is an invaluable feature to have. When wearing these earmuffs, they are a snug but comfortable fit – they can be easily adjusted using the headband which creates an important seal to keep the noise out. This material they have used is very durable – more so that almost all the competition. 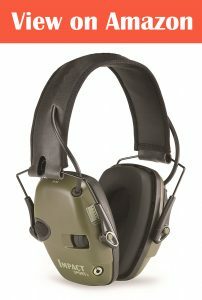 Unlike some other earmuffs these are very low profile and won’t ever get in the way because of this. They also have a 3.5mm jack which will allow you to connect to your phone for example to play your own music if you want. In terms of noise reduction, they are very good – they are easily one of the best when they sound amplification is running and when it’s not – allows for better awareness which is one of the best-selling points to me. They can also be folded up, basically to make them more compact, along with having easy installation of batteries that seem to last forever.